Members of the Class of 1955 from Nash County Training School (NCTS) met this weekend from their 50th reunion. 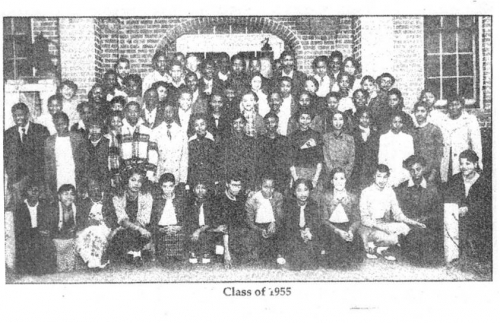 The NCTS was established in 1929 with one building in which were several classrooms, an auditorium, and a lunch room, and it remained a segregated black school until the late ‘60s, one of the reunion’s organizers, Lizzie Low, shared. Students walked as far as five to six miles each way to and from school and many brought brown bag lunches, purchasing only milk at the lunch room, due to the economic situation of the time, she said. The school went through many transitions through the years, becoming Nash Central Middle School in ‘80s, and now W. L. Green Alternative School. 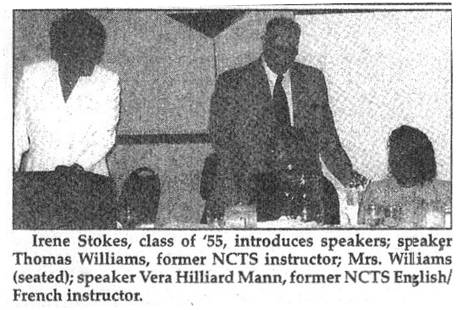 “This little small school prepared and inspired students to seek important careers and occupations.” Lowe said, including New York City Transit vice President of Human Resources (Lizzie Lowe), a Las Vegas Fire Chief (Joseph Roberson), Virginia Postmaster General (Morris Roberson), Howard University Head of Communications Department (Dr. Oveta Harris), Rochester New York Superintendent and Educator (Irene Stokes), New Jersey Educator (Lois Pulley), first black police officers in Nashville (Bob Williams), and New York Restaurant Owner (Martha Stokes). There are many, many more success stories from the NCTS, and just as important were the many homemakers, preachers, beauticians, barbers, and parents that were successful in their fields. The Class of 1955’s reunion began Friday night Sept. 23 with a reception at the Holiday Inn in Rocky Mount, under the theme:”Reuniting, Reacquainting, and Simply enjoying Each Other.” On Saturday, Sep 24, the class held a brunch at the Nashville Community Center and finished the day with its reunion banquet at the Holiday Inn. The class then attended church services on Sunday, Sept. 25, at Thorne Chapel Baptist Church in rocky Mount where Rev. Richard L. Battle pastors. The Class was fortunate to have as its keynote speakers, five of their former instructors, Mr. and Ms. Emory, Ms. Vera Mann, Mr. Thomas Williams, and Ms. Doris Jones. They were kind in their respective speeches not to mention the number of times they sent notes home and visited the parents, counseled and scolded when necessary. They played a big part in nurturing students, instilling the promise that they could be anything they wanted to be by applying themselves. Many of the reunion participants had not seen or heard from fellow classmates since graduating in 1955 and were elated to reunite and reminisce about the “good old days, championship football and basketball games, harmless pranks, strict yet caring teachers, nicknames, courtships, and other memories from those nostalgic days. Rosa Brow Baker, Mildred Lucas Barnes, Walter Harper, Ernestine Bryant Hoskins, Paul Jones, Lizzie Harrison Lowe, Christine Dean Moore, Beverly Lois Pulley Rogers, James Parker, James Powell, and Howard Lee Davis Wilder planned the event.